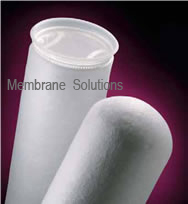 Membrane solutions, LLC complete, in-house control of the production of every filter bag, resulting in highest quality with cost savings passed directly to you. Our integrated technology manages the production of every filter bag, from fiber processing to the manufacture of the felt, to the final creation of the finished filter bags. Therefore, we can provide very highly quality production to meet the concerns our customers face every day: precise micron ratings, consistent performance, proper sealing, fiber migration and bag removal. We also recognize that multiple filtration uses require multiple filter types. That’s why MS manufactures both single- and multi-layered filter bags in a wide range of micron ratings, applicable for either vessel or open filtration systems. Our filter bags come in a variety of materials, such as polypropylene, polyethylene as well as nylon mesh, and a wide assortment of collar and ring types that ensure compatibility with most bag vessels on the market. And most filter bags come standard with the various sealing ring that provides a complete hermetic closure and eliminates the possibility of migration.